Pep Band at CBJ February 19! 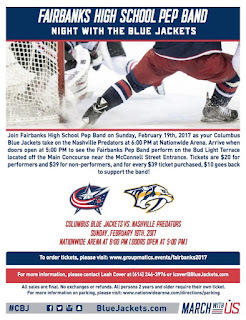 The pep band will be traveling to Nationwide Arena on Sunday, February 19, to perform before the Blue Jackets game vs. the Nashville Predators. You may have heard that the CBJ is the hottest ticket in town because the Blue Jackets are in first place in the NHL! *All band members need to pay for their $20 performer ticket, which is deeply discounted. All band member tickets will be ordered together through the boosters. Please put a check or money order for $20 in the booster mailbox no later than January 30, payable to Fairbanks Music Boosters. If you do not order a ticket, you will not be admitted to Nationwide Arena. If you are unable to attend this event, you must notify Mr. Keller ASAP.